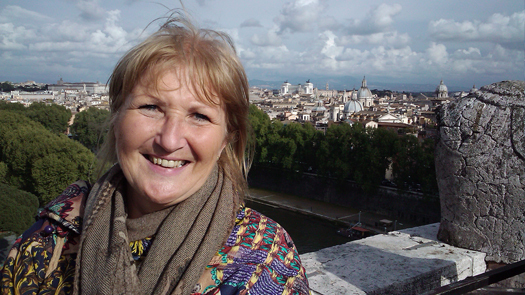 Mary heads our Rome Untour, working and living on the ground in Rome. Recently she took some time to fill us in on her hometown. What do you love about living in Rome? Apart from the very obvious art, architecture, history, food and wine, the climate definitely cannot be underestimated. All the seasons show the wonders of this magical city in different perspectives and shades, so it’s never boring. What are some of your hobbies and passions? Growing my own vegetables is pretty high on the passion list. There is something so exhilarating about producing your own veggies year round. Italian food is an important positive in living here and plays an important role in Italians’ lives. Understanding the quality of genuine produce helps one understand the Italians more. Food is at the center of Italian family life and traditions. What is something people don’t know about Rome? You can use credit cards in taxis. Entrance tickets to Colosseum are valid for two consecutive days and include entrance to the Forum and Palatine Hill, so it is important to leave two consecutive days in your planning. Schedule to take advantage of this. Where are the top places Untourists should explore in Rome? Apart from the famous sites like the Vatican Museum, St. Peter’s, the Spanish Steps, Trevi Fountain, Pantheon, Colosseum, Roman Forum and Palatine? Not to be missed are Basilica San Clemente, Galleria Borghese, Doria Pamphilj Gallery, and Ostia Antica. Also, the sound and light presentation at the Forum of Augustus (from April to end of October) runs in the evening from 9 pm; booking is obligatory. And I recommend the gladiator school if you are traveling with children. What are you most excited about sharing with the Rome Untourist? The insider view. Most guests on the Rome Untour have so little time and want to do so much, so the time they spend with me is precious. I try to present the absolute important things that will make their stay in Rome easy, and I try to share information as concisely and simply as possible so the information can be absorbed quickly. I want them to be ready the next day to comfortably deal with the transportation system and explore the city to its maximum, pointing them in the right direction. It’s important to share my personal favorites with them, whether it’s a museum, art show, restaurant, wine bar or simply unusual gifts to take back home. This gives them an insider view. Aside from sightseeing, what experiences should should Americans seek in Rome? Walking in the city just after dawn. A 6.00am stroll through Piazza Navona or down the Via dei Fori Imperiali reveals a very different place. You find Italians walking their dogs, reading newspapers, very few tourists on the scene. St Peter’s basilica opens at 7 am, and that is the moment to visit it without the hoards of other tourists and no lines; often there are special processions as the priests move to the different chapels to say mass in many different languages first thing. The light just before sunset over the monuments is also so very special, looking from the Circo Massimo towards the Palatine restores your strength at the end of a hectic day. What are some of Americans’ misconceptions regarding Rome and the Italians? Some Americans, particularly those of Italian heritage, have an antiquated view of Italy prior to arrival. Instead notwithstanding the antiquity that surrounds us Romans, Italy has embraced innovation and digital technology. Also, we do not all drive Ferraris either, of course. What do Americans typically love about Rome? Street life, watching the world go by whilst sipping a coffee or glass of wine at a street cafè. Discovering the hidden churches on every street corner. Gelato, but I tell them only to go to the truly homemade locations, Roman cuisine that changes so dramatically with the growing season – Carciofi (artichokes), fried zucchini flowers, typical Roman pasta: cacio e pepe, not to mention the amatriciana. What surprises Americans about Rome? Traffic chaos and amazing scooter driving techniques. Small refrigerators. The lack of clothes dryers and toasters. Italian coffee makers (no American coffee pots here). How noisy Romans are; even the friendliest of conversations is ridden with animation. What are some secretly great places that Rome has hidden? Church of SS Prassede with its triumphal arches and mosaics. A rest and recuperation moment picnic in Villa Borghese and maybe a cycle through the gardens afterwards, or hire an electric golf cart if peddling is not your scene. Visit a Roman neighbourhood like Monti or the Ghetto. The cat sanctuary in Largo Argentina, particularly for animal lovers, is very unusual. The temples have been taken over by about 100 cats that are fed and monitored daily by a group of vets. The cats are always ready for a photo call. Why should people book a Rome Untour? What is the advantage of seeing the area this way? If you want to live like a Roman then Untours is the only way to go. Apartments in the center of the city, shopping at the local grocer or open air market, having your cappuccino each morning at the same neighborhood coffee shop where after a couple of visits the barmen will know exactly your preferences and greet you with a vivacious buon giorno. The Untours on site orientation is a full immersion factual experience that prepares clients for their time in Rome. Cutting straight to the heart of issues, no time wasting with a 24/7 telephone back up as needed. Finding apartments by other means can be a precarious adventure, photos on websites as we all know are not always what they appear to be, but Untours give customers an enormous guarantee. Transfers are reliable and precise, on site staff members are there not only to orient and guide clients in the fun moments but to be present when things go wrong, from minor problems with an apartment to more serious incidents. Any final advice for people looking to visit Rome? Book ahead for the major sites to avoid lines, an absolute must! Warn your bank that you will be travelling to avoid problems with ATM withdrawals and credit card use. Pack your walking shoes and book the trip of a lifetime. Not only will you see the famous sites, monuments, and museums, but you will discover a whole new way of life Learning to live in another culture is a truly great gift that oddly enough helps us to discover more about ourselves. Ci vediamo presto in Rome!